We had a guest pastor today – the high school youth pastor spoke. He started off by recounting a story of someone who approached him and chided him for only preaching the Bible, and not going “deeper”. “How can you get more depth than the Gospel?” he told the congregation. He said a few things that stuck with me. One was, “You can always go deeper in the Bible. You can always go deeper with your relationship with God.” You don’t ever hit the point of “yup, I’ve learned it all”. I liked that reminder – it doesn’t matter if you’ve been a Christian one month or fifty years – there is always more to learn, more to seek, more to know. Sometimes I think we fool ourselves by saying that since we know a lot of Bible trivia, we “know it all”. And since we know all the worship songs by heart, there’s nothing more to say to God. Not so – you can always go deeper. The other thing that stuck with me pertained more to teaching the gospel. He said, “You, the people in the pews, who are hurting and desperately needing the Lord – you don’t care whether it’s premillennial and postmillennial. You need to know about Jesus.” (He said it a lot better than I did; I wish the sermon was online so I could listen to it again. I feel like I can only ingest so much when I hear something! I’m such a visual learner!) While I think there’s a time and a place for learning about eschatology, I liked his emphasis on Jesus being the answer to our problems – going deeper with Him, and not just in religion. What did you learn at church today? 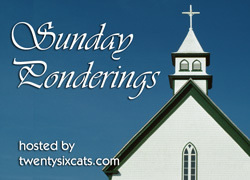 Leave a link to your own “Sunday Ponderings” blog post, or you can just mention your thoughts in the comments. Read more about this weekly carnival and get the code for the “Sunday Ponderings” graphic here.